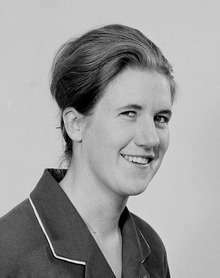 Dr Dame Bridget Margaret Ogilvie, AC, DBE, FRS (born 24 March 1938) is an Australian and British scientist. Ogilvie was born in 1938 at Glen Innes, New South Wales, Australia, to John Mylne and Margaret Beryl (née McRae) Ogilvie. During her primary school years, she had a single teacher, and three other students in her class. She was educated at the New England Girls' School (Armidale, New South Wales), finishing in 1955. She completed a BRurSC (Hons I) degree in Rural Science at the University of New England, graduating with the University medal in 1960. She was awarded a Commonwealth Scholarship to attend Girton College, Cambridge, where she earned a PhD for her work on Nippostrongylus brasiliensis. 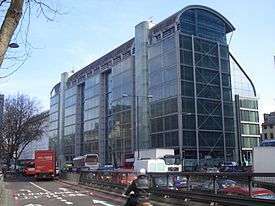 Ogilvie joined the Parasitology department at the Medical Research Council's National Institute for Medical Research (NIMR) in 1963 and spent her academic career there studying immune responses to nematodes (intestinal worms) until 1991 when she was appointed as the Director of the Wellcome Trust. She remained as Director until 1998, when the Trust was turning its attention to "public engagement with science". She was the first Chairperson of the Medicines for Malaria Venture (MMV) Board. Since her retirement, she has played a significant role in public engagement with science and science in education. As a trustee of the Science Museum and chair of the AstraZeneca science teaching trust, she served as chair of COPUS and Techniquest. She has served as currently Vice chair of the board of Trustees of Sense About Science and is a Visiting Professor at University College London. In 1994 she won the Kilgerran Prize of the Foundation for Science and Technology. In the 1996 New Year Honours List, Ogilvie was made a Dame Commander of the Order of the British Empire (DBE) and was elected a Fellow of the Royal Society (FRS) in 2003. In 2007 she was appointed a Companion of the Order of Australia (AC), Australia's highest civilian honour, with the citation: "For service to science in the field of biomedical research, particularly related to veterinary and medical parasitology, and through support for research funding to improve global health." She is a member of the Advisory Council for the Campaign for Science and Engineering. In 2008 she was elected to the Australian Academy of Science. ↑ McCann, Kate (23 April 2013). "Dame Nancy Rothwell: 'Break the rules and see what happens'". The Guardian. London. Archived from the original on 10 July 2013. ↑ Ogilvie, B. M.; McClymont, G. L.; Shorland, F. B. (1961). "Effect of Duodenal Administration of Highly Unsaturated Fatty Acids on Composition of Ruminant Depot Fat". Nature. 190 (4777): 725. doi:10.1038/190725a0. ↑ Philipp, M.; Parkhouse, R. M. E.; Ogilvie, B. M. (1980). "Changing proteins on the surface of a parasitic nematode". Nature. 287 (5782): 538–540. doi:10.1038/287538a0. PMID 7422005. ↑ Ogilvie, B. M. (1964). "Reagin-like Antibodies in Animals Immune to Helminth Parasites". Nature. 204 (4953): 91. doi:10.1038/204091a0. 1 2 "Advisory Council of the Campaign for Science and Engineering". Archived from the original on 28 August 2010. Retrieved 11 February 2011. ↑ It's an Honour: AC; accessed 8 April 2014.